This article is also being published on CleanTechnica and the EV Sales blogspot. The Chinese market had some 34,000 new EVs zooming the streets last month, a 188% increase over the same month last year, in-line with the annual growth rate. EV market share surpassed the 1% barrier in July, reaching 1.1% of new car sales. All the while, 96% of the market belongs to domestic brands. For the record, of the 4% left for foreign brands, 2% belongs to Tesla, 1% to Porsche, and a remaining 1% is for the remaining automakers…. #1 — BYD Tang: The 500 hp “Chinese Cayenne” continues its success story in the EV market, but deliveries dropped 14% compared to the previous month, to 3,032 units. You can blame it on production constraints or is question if the flagship BYD is finding its cruising speed around 3,000-something units per month. #2 — BYD Qin: This 300 hp PHEV sedan registered 2,756 units in July, continuing on its growing sales trend for the sixth month in a row. Will BYD be able to provide enough units to beat the Qin all-time record (4,030 units, July 2015) by September? #3 — Zhidou D2 EV: This tiny two-seater is the sole representative in the Top 5 of a class of cheap city cars that once were the most popular kind of EVs in China. Things have clearly moved on, with larger, more sophisticated models taking over. Still, there is space for these urban dwellers, and the Zotye D2 was the best seller in the class in July, with 2,209 units moved. 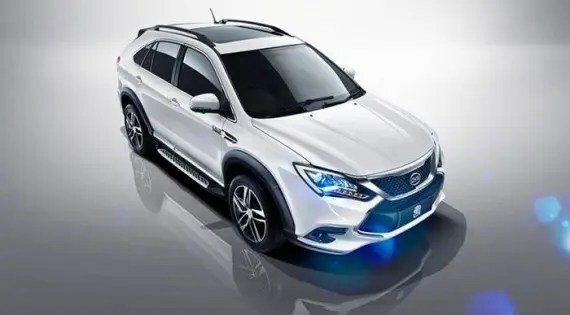 #4 — BYD Qin EV300: An all-electric offshoot of the most common plug-in in China, this 218 hp, 300 km BEV has registered 2,075 units, continuing on this growing sales trend. Will it overcome its PHEV sibling soon? This Audi A4–sized model goes from 0 to 100 km/h in 7.9 seconds and costs (in China) between US$40,000 and US$48,000, before incentives. #5 — SAIC Roewe e550: Shanghai-based SAIC expects to replicate the BYD Qin success with this model, the e550, a plug-in hybrid version of its 550 ICE bestseller. In July, the e550 seems to have plateaued at 2,000-something units per month, with 2,065 units moved, as SAIC is now concentrating efforts in ramping up production of its larger relative, the e950 full-size barge car. In the podium positions, the BYD Qin switched positions with the BAIC E-Series and reached 2nd place, while the Roewe e550 climbed yet another position to 4th. A worthy mention includes the Chery eQ, registering 1,839 units, a year-best performance, jumping to #6. Additionally, three models reached new highs: the Geely Dorsett EV registered 1,556 units in July, climbing to #9; the BYD e5 sedan delivered 1,358 units, reaching #10 (that’s the 4th BYD in the top 10); and the Zotye E200 city car climbed to #15, with 1,603 units. Just missing out on the top 20 — by fewer than 200 units — the BAIC EX200 (1,502 units in July) is in the intersection of the two fastest growing trends in China — SUVs and EVs — so it is safe to say that this model will join the top 20 (10?) soon. Looking at the manufacturer ranking, BYD is the leader with 33% market share, but lost an additional 2% share last month, since the market has been growing faster than the Xi’an-based company. In 2nd place we have BAIC (12%), followed by SAIC Roewe (8%, up 1%) in 3rd, which switched positions with the #4 JAC, (7%, down 1%). Author’s note: As you might have noticed, there were some readjustments to the rankings, due to new brands (Lifan) being on the radar and the breakdown of some models that previously were together (e.g., Kandi K-Series and JAC I EV series).